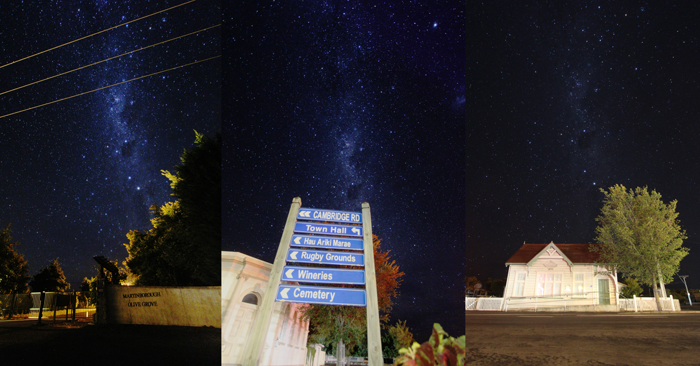 Views of the night sky over the city of Martinborough, New Zealand. Photos by Lee Mauger. Martinborough, New Zealand, is highly regarded internationally for producing fine wines, olive oil and food within a rural environment of outstanding natural beauty. For some time, the community has enjoyed breathtakingly clear views of the night sky on its doorstep and an abundance of wildlife and birds which thrive without light pollution. The stunning night skies above Martinborough have attracted local astronomers and astrophotographers, including international award-winning astrophotographer Mark Gee. “The Martinborough area was where I first honed my skills as an astrophotographer, and on a clear night the clarity in the night sky is incredible!” Gee said. “During my travels around the world, I haven’t found too many dark sky locations which come close to what Martinborough has to offer,” Gee said. Martinborough’s dark night skies came under threat when, in 2017, the Town planned to replace all existing sodium street lights with white LED lights at a color temperature of 4,000 Kelvins. Members of the Martinborough Dark Sky Society were alarmed about the potential 4000K street lights, which would emit bright, white lights with considerable glare. The lights would also potentially create new light pollution, adversely affecting the clear views of the night sky and harming local wildlife. The International Dark-Sky Association (IDA) works to protect the natural nighttime environment through conservation, awareness and education, and the promotion of environmentally responsible lighting products. IDA recommends LED streetlights with a color temperature of 3,000 Kelvins or less. These lower color temperature lights, when fully shielded to prevent upward light emission, minimize light pollution and are warm, inviting, and well able to safely and effectively serve the needs of municipal communities. With IDA’s recommendation, the district council and Martinborough Dark Sky Society were able to galvanize the community and convince central government agencies to adopt IDA’s 3000K recommendation and alter their street and highway lighting plans. IDA’s “3000K or Less” promotion provided a vital external and international knowledge base to help counter an imminent increase in light pollution which would have been difficult to reverse. The Martinborough Dark Sky Society, in Martinborough, New Zealand, is a community initiative to protect and enhance the beautiful dark skies and natural wildlife habitats of the area. As a part of their night sky conservation efforts, the Society is working toward the certification of a 1500+ square kilometer area recognized as an International Dark Sky Reserve by the International Dark-Sky Association.